A £13m extension and upgrade to Dorset County Museum has been approved. The extension to the 19th Century museum in Dorchester includes new galleries, a learning centre, library, cafe and shop. The Grade I listed building was built to house the museum's collection, which now boasts four million artefacts. Planners approved proposals to reconfigure and extend existing buildings, install a shop front and demolish un-listed buildings. The museum is to host the Natural History Museum's diplodocus skeleton replica which is touring in 2018. Dippy on Tour, which will be in Dorchester from 10 February to 8 May, will be the last temporary exhibition to be hosted by Dorset County Museum before parts of the galleries are closed for the refurbishment. 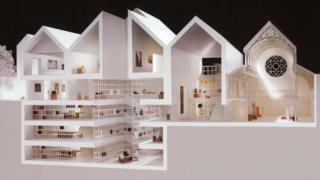 The extension is being part-funded by a £10m lottery grant, with the museum raising the remaining £3m.